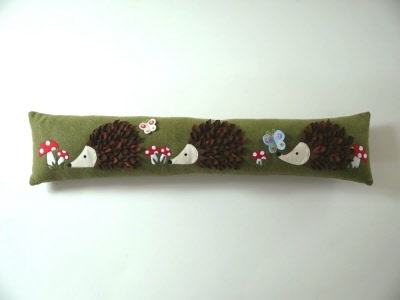 A sweet little draft excluder designed by Gail Penberthy to keep out those winter chills! Featuring one of our favourite English animals, the little hedgehog, it is easy to make and uses felt to give the hedgehogs a three dimensional feel. It measures approx 34 x 7 1/2 inches. The kit contains all wool/acrylic mix felts,and buttons along with the pattern. Please note this does not include the stuffing or cushion pad.